In the week that Manchester announced a £1.5 bn investment plan (with £160 mn already allocated) for a comprehensive cycle network, Birmingham City Council has released highway plans that show it does not know how to carry out joined up transport planning nor how to facilitate cycling. At the end of June, the Traffic Regulation Order consultations for Sheepcote Street and for the Bathrow bus gate were released - you can find them on the BeHeard portal - the links are: Sheepcote Street consultation; Bathrow bus gate consultation. Both these consultations state that they aim to help improve public transport, but they both contain flaws that will hinder cycling and walking. We reported previously about the non-statutory design consultation on these schemes in March. This month we have the formal statutory consultations on the Traffic Regulation Orders (TRO) that will be necessary to implement the proposed highways changes in the schemes. Objections raised to these statutory consultations are more important than those raised to the earlier consultation. Although we are in favour of better permeability for public transport, we recommend that you object to both of these consultations, because of the lack of planning for cycling. Please note: The consultations both close on Thursday, July 19th, 2018. At the end of this article, I have attached copies of Push Bikes' formal responses to these two consultations. You can read and use them in your responses if you like. First, though, I will go briefly through the issues with Bath Row bus gate and the Sheepcote Street bus gate. You might also like to read our article from March on the initial plans. Have the plans for the bus gate at Bath Row improved? We reported in March that the plans did not include any provision for people who were cycling. At the Birmingham Cycle Revolution (BCR) stakeholders meeting in May, we spoke with a member of the team working on the Metro - although he was not one of the officers who designed the bus gate. We were told that there were no plans to include a segregated cycle track despite there being a BCR main corridor route alongside the Middleway from Fiveways to Bristol Road running across this junction. Instead the pedestrian crossings would become toucan crossings and cycle users would share the space with people walking. Our suggestion of closing the exit from Bath Row onto the Middleway for motor traffic had been rejected with the reason that it was needed in case all three motor traffic lanes on Wheeleys Lane were closed. The message is that facilitating motor traffic is still much more important than facilitating cycling - the exit from Bath Row onto the Middleway is used by far fewer motor vehicles than Wheeleys Lane but it "must" be kept open in order to ease motor traffic flows once every few years, rather than providing more space for people cycling and walking to facilitate their flow every single day. Can we see changed layout at Bath Row so we can make an informed decision? The TRO consultation for the Bath Row bus gate does not include any information at all about what will happen on the pavements or controlled crossings. There are no detailed plans showing any of the changes that we were told would happen, such as toucan crossings and shared use pavements. It is not clear why Birmingham City Council are not providing those details. Why should we object to the Bath Row bus gate? Although it is important to facilitate public transport, it is also vitally important that all new highways projects include cycling and make it better to cycle. The West Midlands Combined Authority cycling charter is very clear that all transport infrastructure built now must not require expensive retrofitting of high quality cycle infrastructure later on. In that respect, the Bath Row bus gate proposals fail - we want you to object because the proposed plans do not include appropriate cycle infrastructure of a high quality which meets best practice. What are some talking points we could use in our response? Firstly, Lee Bank Middleway, from Five Ways to Bristol Road, is identified as a priority corridor in the West Midlands Strategic Cycle Network, and has a BCR route being developed along it. This scheme has to fit into that. Second, there are very high levels of pedestrian traffic in this location at rush hour, from Five Ways station to businesses around Five Ways, Broad Street and Hagley Road. Shared-use pavements and crossings are not a long term answer. What could we ask for? A high-quality segregated cycle track across the mouth of Bath Row that can be integrated into the full route later on. No exit for motor traffic out of Bath Row onto the Middleway - to provide more space for the cycle track; reduce traffic lights; improve the turning circle for motor traffic accessing Bath Row from the far-side of the Middleway. A high-quality segregated cycle track from George Street across the Middleway, using space obtained by stopping general motor traffic turning left out of George Street. This also provides more time for pedestrians to cross the Middleway. See our formal response below for more details. Are the plans for Sheepcote Street any better? 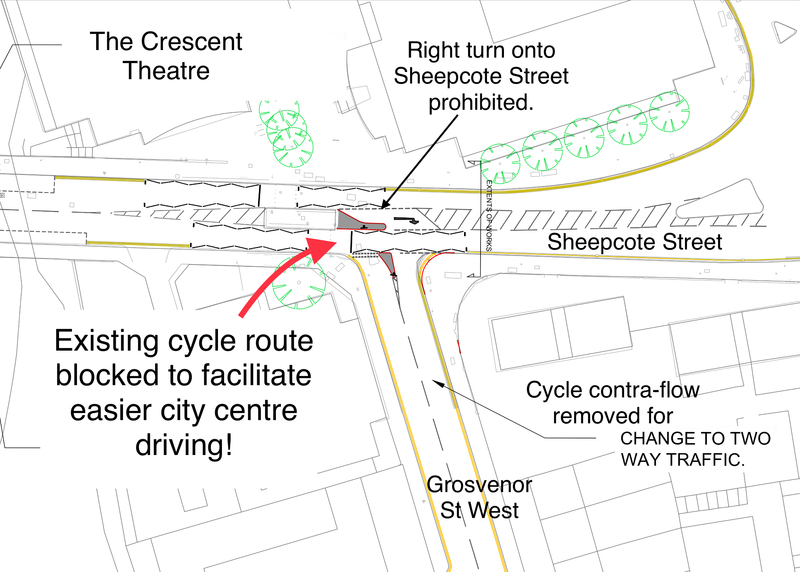 Since the consultation in March, the plans have been changed to reintroduce two-way motor traffic along Grosvenor Street West but ban the right turn onto Sheepcote Street (See the diagram below). That re-introduces large volumes of motor traffic on what is currently a quiet cycle route and bans a right-turn that is used daily by many cyclists. The new changes proposed to Grosvenor Street West will have a significant negative impact on cycling conditions. The plans for Sheepcote Street will actually make cycling worse? This is despite Birmingham City Council stating on the consultation page that they want to "reduce reliance on car journeys through encouragement of modal shift." We are not clear how making the road environment worse for cycling is supposed to encourage a modal shift towards cycling. A modal shift away from comes requires walking and cycling options to be the easier and more attractive choice than getting in the car. What are the specific issues with the plans for Sheepcote Street? Firstly, Grosvenor Street West will be made two-way for motor traffic along its whole length, with the right turn onto Sheepcote Street banned (see the diagram below). As discussed above, this will close off a route that many cycle users follow along this street, onto Sheepcote Street, and then onto Broad Street. Permeability for cycles here will be reduced and the cycling environment will be made worse by the increased volume of motor traffic. Secondly, by removing the (unused) bus gate on St Vincent Street, and re-directing through traffic away from Sheepcote Street, the pedestrian environment there will be made worse. There are many families who walk through the St Vincent Street / Sheepcote Street junction every day to take their children to school, but the only pedestrian crossing point will not be controlled, and it will not be in a convenient location for families walking down Sheepcote Street and then trying to cross. In our initial response to the consultation, we pointed out that this was dangerous and that more pedestrian crossing facilities were needed on St Vincent Street. Thirdly, cycle users who want to turn onto Sheepcote Street from St Vincent Street will find it difficult because of the flow of motor traffic. We suggested in our initial response that a mini-roundabout should be used at the junction of Sheepcote Street and St Vincent Street, to slow down motor traffic and make it easier for cycle users to turn. Our suggestion was ignored, and the problem remains. Why should we object to the Sheepcote Street plans? The plans actively making cycling worse - blocking attractive cycle routes while increasing the amount of motor traffic on quiet roads. They also make the road environment worse for pedestrians, by making St Vincent Street more difficult to cross with a single crossing point in an inconvenient location that will not be adequately used. The core proposal of the bus gate is a good idea, but the changes made on the edge of this scheme are counter-productive. This diagram shows the proposed changes to Grosvenor St West, replacing a contra-flow cycle lane with 2 way flow for motor traffic. The contra-flow links up with a right-turn onto Sheepcote Street, to access Broad Street, but the plans would remove that right-turn facility. The proposals seem designed to take motor traffic away from Broad Street and the top of Sheepcote Street, and put it onto Friston Avenue and Grosvenor St West.